LAU’s renowned SINARC began offering its first courses at NYAC in January 2014. Since then, a wide variety of Arabic language classes have been taught at every level – elementary, intermediate, advanced, and the Levantine dialect. We also offer private courses for individuals or small groups with specific needs and goals, all at very affordable rates. Classes are taught by instructors who are native speakers with many years of teaching experience, specialized in reading, writing, and verbal communication. Classes are held in the evenings and on weekends, providing students and working professionals with convenient times and options to fit their schedules. Courses taken for academic credit are transferrable to the student’s home institution. Our center has accommodated students from Columbia University, New York University, and CUNY, among other institutions. Courses will be offered based on the number of enrolled students. Short Placement Tests will be e-mailed to students upon receiving their applications to help determine the classes they will join. This student placement is however preliminary and may be adjusted after students meet with their instructors on their first day of classes. Formal instruction in language is enriched by immersion in an authentic cultural context. Cultural activities include lectures on topics related to Arab and Lebanese politics, history, society, and culture, as well as documentaries on certain historical sites and events in Lebanon. This elementary course is designed for students who have no knowledge of Modern Standard Arabic. It offers a unique opportunity for descendants of Arabic- speakers to revive their lost language and cultural ties with their ancestors’ land. The course is open to the general public, students of Middle Eastern studies, business people, embassy officials and children of foreign nationals stationed in the Middle East. In this course, Arabic language instruction aims for basic proficiency in the four language skills: speaking, reading, writing, and listening. By the end of the course, students are able to handle basic daily life situations. This course is a continuation of SIN 101A. It is designed for students who have knowledge od the alphabet and very basic grammar. By the end of the course, students are able to handle many daily life situations, such as identifying the self and others, naming familiar objects and people, telling time, asking for directions, describing places of residence and national origins, ordering food and drink. Students must have completed approximately one semester of Arabic (or the equivalent) to be able to join this class. They must have the ability to read and write using Arabic script, have a limited working vocabulary and a basic understanding of sentence structure and other basic grammatical concepts. This course is a continuation of Elementary Arabic and expands on all four skills of language learning; reading, writing, speaking and listening. Students placed in the intermediate level should have taken at least one year of Arabic in college (or the equivalent), and have acquired a basic knowledge of the structure of Modern Standard Arabic. This course aims at enabling students to read, write, speak, and listen at a competency level equivalent to intermediate-mid on the ACTFL scale. Classroom instruction focuses on basic Arabic morphology, syntax and vocabulary building, as well as on reading, writing, speaking and listening skills. Students are asked to comment on most daily-life situations, write descriptions and argumentation and read a variety of styles. This course is a continuation of Intermediate Arabic I and expands on students’ acquisition of vocabulary and grammar skills. At the end of this course, students will be able to read longer authentic Arabic texts with greater ease. They will be able to write short essays and give short presentations. Students placed in the advanced level should have completed the equivalent of two or more years of Arabic in college. They will have acquired a broad vocabulary and mastered basic Arabic syntax and morphology. Class sessions aim to help students attain proficiency in expository and argumentative discourse and handle a variety of communicative tasks. Students placed in this level have no previous knowledge of the dialect. The aim of this course is to provide students of Modern Standard Arabic with an opportunity to learn the basics of the Lebanese dialect. Students in this level will learn to communicate with native speakers in various daily situations. This course is designed for students who have had some exposure to the Lebanese dialect. The classes will enable students to practice their speaking skills and improve their pronunciation and fluency. Students will converse on topics using description, narration and argumentation. Refund Clause: Please note that there will be no refunds on program fees after the start of the session, unless the university cancels the program for unforeseen reasons. 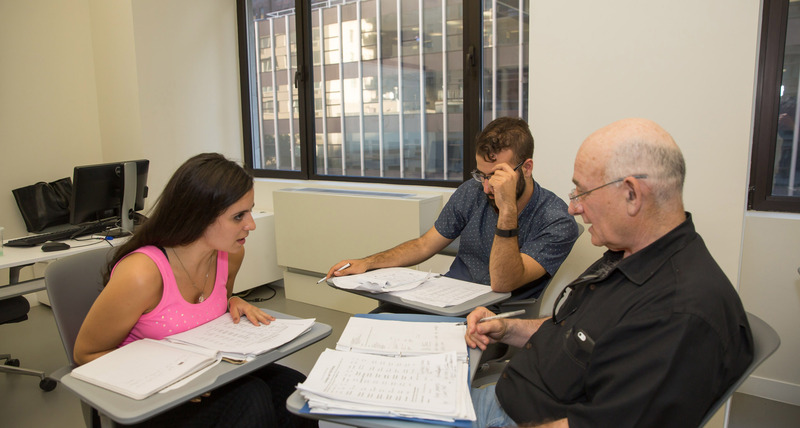 Rasha Arabi teaches Arabic at various academic institutions including LAU, the City University of New York (CUNY), New York University, as well as in the United Nations language program. She teaches both Modern Standard Arabic and the Levantine dialect. As a Fulbright scholar, Rasha completed her MA in Middle East Studies at the CUNY Graduate Center. She also works as a freelance translator for multiple organizations and participates in poetry readings at art venues around New York. Firas Sulaiman has 14 years of experience teaching Arabic at various New York City academic institutions. Originally from Syria, he teaches both Modern Standard Arabic and the Levantine dialect. He finds comfort in helping students achieve their goals when studying a foreign language. Firas is an accomplished poet who has published six collections of Arabic poetry and a collection of short stories. His work has been translated into English, Swedish, French, Romanian, Spanish, and Croatian. Official Lebanese American University website. Copyright 1997-2019 LAU, Lebanon.